There has been so much discussion about the status of gay athletes in professional sports. Hearing both sides of the panel about whether or not a gay athlete would be accepted in a male-dominated team sport, whether it’s hockey, basketball, baseball or football. A lot of the issues that plague a gay athlete in the professional arena are also seen for everyday athletes (also continue to exert themselves for everybody else) such as locker room etiquette. As an athlete myself, having competed in amateur and collegiate levels of sport, my experience has definitely been varied itself. As a swimmer I’ve swam with several different teams, including a LGBTQ+ local Masters swim team here in Denver, as a team we compete at various meets and competitions locally as well as nationally; LGBTQ+ oriented and not. Throughout my time in competitions I have overheard or directly have been involved with individuals and people who exert their homophobic nature in such a way, usually making comments about “the gay team” or something a long those lines that remind me I am here as an athlete, that my sexual orientation has nothing to do with my participation in sport. For the homophobic individuals in the competition, my sexual orientation may affect their competition, but it doesn’t affect mine. In the world of collegiate swimming I initially entered with my usual approach when introduced to new people in a new situation, keeping reserved and focused on the task at hand until I grow more comfortable with my surroundings and teammates enough to really open up and be who I am. It took time, dealing with fears of how will my teammates react in the locker room, hotel room assignments during trips, even simple interactions outside of the pool and team social events, how would I fit in? It took a little time to really come out; in that time my teammates got to know me as a swimmer, college student and person. Finally in the coming out, which wasn’t really that grand, initially the reaction was surprise, mostly because I didn’t quite fit into the stereotype they perceived, as a gay person should be. However my initial fears were completely unfounded I am still the same person I was before, gay or straight. As time went on and the season continued, I found that my teammates made more of an effort to abstain from homophobic language, saying that’s gay and such and putting forth an effort to make me feel accepted and part of the team. Something I wasn’t expecting as I came out but definitely a positive approach that made me feel more comfortable and more apart of the team. Again realizing that my sexual orientation had no effect on my training performance as an athlete as we are all there for the same reason, to swim. As an athlete I continue to participate and compete in a variety of sports, swimming and running events. Although my sexual orientation doesn’t necessarily define myself as an athlete, it still contributes to my overall wellness and is an important reminder is that sport is diverse. Everybody from every single walk of life can participate in one way or another but it’s too often easy to forget the level of diversity and the acceptance associated. Seeing professional sports on TV is a constant reminder that the diversity people recognize is most often external. 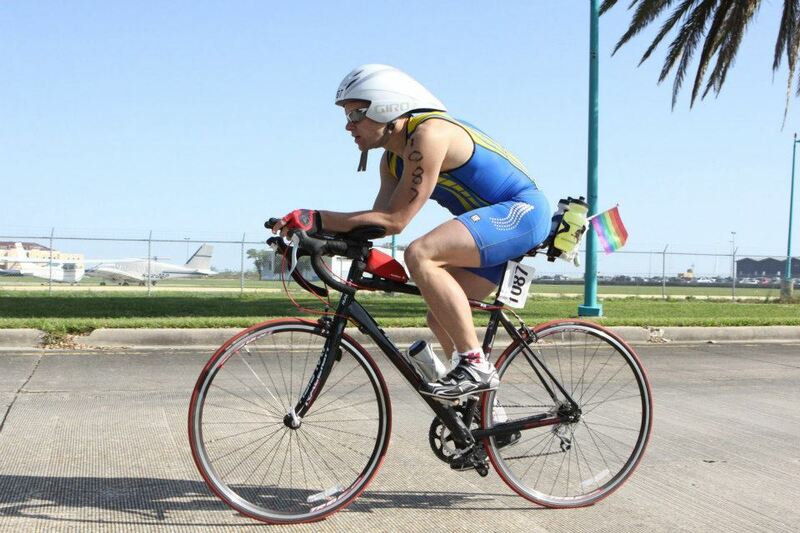 At my last Ironman triathlon, I had a small rainbow flag attached to the seat of my bicycle and rode proud throughout the 56 miles, not necessarily to make a statement or some kind of political gesture. It is to remind my fellow athletes that an athlete can be anybody, come from anywhere. Sport is just as diverse as our community, it is not external by any means, all that matters is how much effort did you put into it, that you finished strong and gave it your all. Realizing that in the end, my fears and intimidations were more personal than anything, although there has been some negative response and interactions for being a gay athlete, I have found such interactions have not been any more or less than you would otherwise experience anywhere else. Our own stigmas and fears are what prohibit us from partaking such events and allowing us to truly be who we are. With the recent announcement of Robbi Rogers retiring from MLS, we realize that the sport and community itself are much more accepting than one might realize. Of course with the uncertainty of such a response there is definite cause for caution and hesitation. However in the end most people are more concerned about your success and accomplishments as an athlete, regardless of your sexuality.